Diving into the cool blue waters is like entering a whole new world. New species to encounter. Granite rocks. And maybe if you're lucky, the odd bit of buried treasure! The activity of diving is a treasure in itself, and one such gem is the Nautilus Diving Centre, which was the first of its kind to be established in the Sardinian region of Palau in 1994. If you're a Palau local, it's especially convenient as the centre is based in the heart of the area, and only a minute's walk away from the local port. There are plenty of PADI (Professional Association of Diving Instructors) approved courses to be had at Nautilus from starter level to professional standard. Anyone wishing to go on one of these courses will get the benefit of purpose-built diving boats and first class diving equipment, which includes Seacsub suits full length wetsuits, Aqualung regulators, Technisub BCD’s, fins and masks. Steel tanks are provided – generally these are 12lts, although some 10lts and 15lts are also available. Palau is an ideal location as it's close to a good number of ideal diving sites. 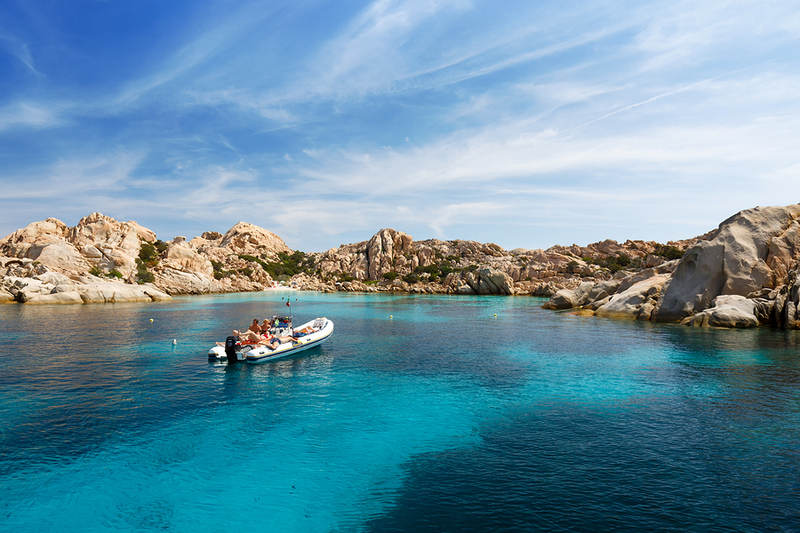 It's also possible to reach the Archipelago of La Maddalena and the Reserve of Lavezzi (most dive sites can be reached in a matter of minutes – the maximum time is 50 minutes). The trip will begin at 8am, and will feature two great dives as well as a surface interlude of one hour before returning to Palau at noon. Snacks and drinks are provided as part of the package. If you're a diving fan, then there is plenty to enjoy in the region. For example, fans of history and shipwrecks can enjoy the cargo ship, Angelika. For those more interested in natural history, then look out for Posidonia Oceanica, a kind of plant that covers the sedimentary bottoms, acting as large-scale nurseries to the likes of molluscs, crustaceans and fishes. You may catch a glimpse of all kinds of marine life, including the odd octopus, lobster and stone fish. The ultimate diving experience awaits – so if you're a budding beginner or an experienced veteran, then take the plunge! Become the captain of your ship with a choice of sailing courses courtesy of AT Watersports Sardegna. A number of courses are available, whatever your interest. First up is the Dinghy – Varuna Sailing Course. In only three days, you will learn to master the principal building blocks of sailing in an open boat (Varuna 500 or 460). Each of the three days offers a three-hour session, at the end of which, if successful, you will gain the official, world-recognised VDWS certificate. The more experienced sailors can also benefit from refresher or private lessons. Younger ones can start their sailing experiences in earnest with the Optimist Sailing course. Kids between six and 12 years of age will learn all about this much-loved activity on board the Optimist boats, and again, there's a VDWS certificate up for grabs if passed successfully. A halfway home between the Optimist and the Dinghy is the Laser Pico – or the RS Quba, a lightweight, flexible and nippy vessel that can be used either by beginners or advanced sailors. The course is open to both children and adults, and depending on age, is based on a six-hour or nine-hour time-frame. Last but not least is the Catamaran Sailing Course, in which you board a Hobie Cat 16 which can get up to a top speed of over 20 knots. Again, this VDWS recognised course is a nine-hour deal over three days and teaches budding students everything they need to know about the basics of catamaran sailing. On a smaller scale, you might like to take to the Sardinian waters by a different kind of vessel: the kayak. A perfect place to appreciate Sardinia's finest is on the east coast. And what better transport to use than kayak? 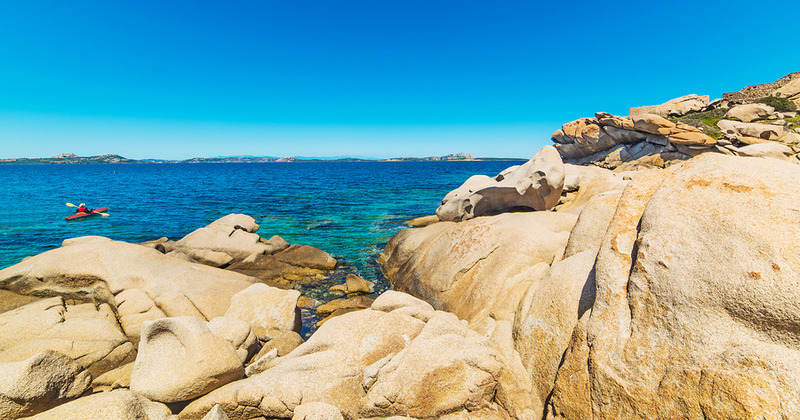 This way, you can enjoy the natural splendour of Sardinia in perfect quiet. On the way, you can take in many a beach, cave and high limestone cliff. A perfect guide to this is Cardedu Kayak, which plays host to both beginners and experts. It offers an impressive number of itineraries, 64 in number, which cater for all abilities and ages. There are all kinds of package available, whether you would like a half-day or multiple-day trip. Not only can you get to enjoy the wonderful destinations in the day, you can also get to experience them at night. The nightly offerings include a spot of fishing and camping too, which makes it a good choice of excursion for either school trips or small groups looking for a great natural break. Both for Sea Canoe and Olympic Canoe, basic and advanced level courses are available. The basic courses pack in plenty of things to learn and do, including theoretical practical exercises, basic techniques and methods, plus guides to safety and self-sufficiency. Meanwhile, the advanced courses include extra elements such as paddling, support and racing. All of the courses are overseen by a FICK (which stands for Federazione Italiana Canoa Kayak) instructor, ensuring total safety. If you're paying a visit to the Lazzaretto Beach (which is close to Alghero), then you must try out a spot of stand up paddling and surfing. The Sardinia Water Experience centre provides ample scope for both of these enjoyable activities. Because the bay is located in the middle of the area, it's surrounded by other beaches, which means that all kinds of conditions are catered for, such as downwind, flat water and surf. The centre also boasts some high quality products, such as O'Neill, SIC Maui and Lass Padde. All kinds of Stand Up Paddling initiatives are on offer at the centre, which include personal and cross training, fishing and yoga. A surf school and safari are also provided in addition to Flatwater cruising, Flatwater and Elite racing, and Downwind courses. In short, everything that you could want for the perfect water activity experience is right here. Surfing: A breathtaking way to enjoy the sea, and the subject of many a Beach Boys tune. If you're looking to go Surfin' Sardinia, then a good port of call is the Is Benas B&B Surf Camp and Resort. It's based in the central spot of the Sinis Peninsula, and is only five minutes away from the beach on foot. Accommodation-wise, this is a comfy and modern stay, with plenty of facilities to enjoy, including a wooden patio, large garden, and a shared lounge with TV. If you're in a group of friends or a family wanting that ultimate surfing experience, then the rooms are more than adequate. There are a number of packages available, spanning different requirements and lengths of stay. The Basic Package provides you with three nights in the surf house (complete with breakfast), and includes training, surfboard and wetsuit hire, plus a certificate of attendance. The Mini Package is for five days at Surf Camp, and again provides you with your accommodation, breakfast, use of facilities and certificate. The two weekly packages are Mini (10 hours worth of lecture – Surf Stage) and Full (16 hours), with unlimited surfboard use, certificate, and of course, the accommodation and breakfast. Fly as high as a kite with the Kitesurf Sardinia School and discover an exhilarating experience. Based on the south west coast of Sardinia, the region provides the right wind levels for this activity, as it's said to be one of the windiest areas of its kind on the island. Located on the Porto Pino beach, the kite centre looks out on to some fabulous views. You can't get much better than the beautiful sandy vista that looks out on to the clear seas. The school is run by passionate, dedicated staff who are IKO (International Kiteboarding Organisation) certified. The kite lessons available are geared towards all abilities from beginner to experienced. An IKO certified instructor will take you through your lesson which will include all kinds of activities and theories including wave riding techniques and jumps. Video coaching and radio helmet facilities are also available. And if you're looking to make this into a memorable vacation, then Kitesurf Sardinia offers its own holiday package, a kitesurf camp which provides you with both informative, enjoyable lessons and quality accommodation.